Sniki is a social networking wiki built to help you share and discover new social networks, social marketing campaigns, tracking tools and users with similar interests. Social Software, Social Media, Social Marketing… Tracking… WHY? Social software is useful for many reasons – conducting market research, understanding modern public relations, and networking relief workers after a disaster are but a few. Different missions require different social software. Many novice end users will probably know their mission requirements, but will not know which Web 2.0 tools are the best fit. As a first step towards helping such users, this “social software encyclopedia” catalogs over 1000 social networking sites and begins to describe their properties. We encourage you to use this social networking wiki for your research, and to contribute to it as well! New to Sniki? Click here to Join. Click here to learn more about Sniki and Sniki Wiki's founders. Click here to learn how to create a new page. Click here to learn how to edit pages. Click here to see a list of social media campaigns. How to add comments to a Sniki Page. Who created this wiki, and why? (http://twitter.com/desaraev) is a new media consultant and market researcher, involved in web optimization, user interface, blogging, and social marketing. She is an expert in testing new social software and oversees development, design, and strategic direction for her clients (http://dveit.com/). Based in Minneapolis / St. Paul, MN, she is a graduate of Iowa State University. is a biological scientist and a policy advisor to the federal government. He is an expert in animal behavior, ecology and evolution, and genomics. Based in Washington, DC at the Center for Technology and National Security Policy, he is a graduate of the University of Rochester and the University of California, and conducted postdoctoral training at New York University. is a research component of the National Defense University, part of the U.S. Department of Defense. Based at Fort McNair in Washington, DC, it produces policy analyses, research, and other support to the Office of the Secretary of Defense, the Joint Chiefs of Staff, Combatant Commanders, and other U.S. Government agencies. Please read the following before redistributing content. This wiki is licensed under a Creative Commons Attribution-ShareAlike 3.0 License. Prior to redistributing and content on this site, please read through the license agreement. While you are allowed to use any of the information on this site, it is illegal to use any of the material or alter any of the content in Sniki with out referencing the founders of the wiki (Mark Drapeau and Desarae Veit), including the name of this wiki (sniki), and a link to the page you found your information. 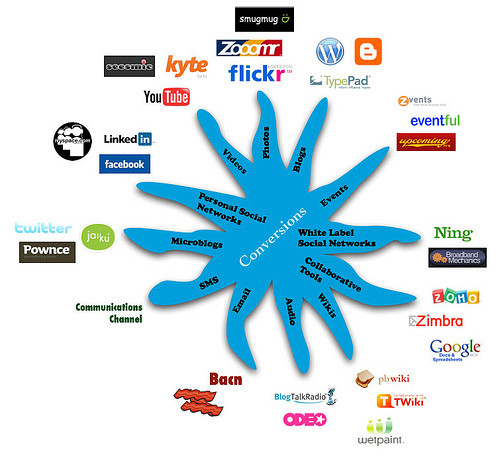 Social Networking List and Information to Help You Compare or Leverage Social Media. What is "Social Media" or in many cases it is also called "New Media"? These titles simply stand for a network of online sites designed to connect people in communities across the world via the web. Online photo sharing, video streams, audio networks, facebook, myspace, microblogs, schedule sharing the list goes on and on. This wiki is a list of social networks and new media categorized and arranged by how you can leverage them for your personal benefit (to choose which one you like the best), to share ideas and opinions, and to teach companies where their consumers are online. Who started this wiki and why? In the long run I, Desarae A. Veit or my username on all of these networks desaraev (dveit.com), started this list for myself and a client (Mark Drapeau of the Department of Defense). This list helps me to categorize and arrange the nearly 1,000 social sites I'm a part of and in the long run helps me to leverage each of these sites for my many clients looking to join their consumers in the online space or just to learn more about their consumer's persona, their wants, needs, and how they can connect on a deeper level. Get help launching your wiki by visiting my blog, Interactive Medias or hire me to answer more of your questions, or start a campaign just visit dveit.com. If you know of a site that is not part of the list, please join in the discussion and add it to the wiki on the appropriate page! A Quick Set of "Guidelines"
Wikis are editable pages that YOU create. No one has "forgotten" or "left out" anything. You just haven't added it yet. YOU can edit this. You have the power. If you want to recommend someone join this site send them an invite. The basic idea is to give people a starter point to find something new and interesting. There is no one authority. If you've clicked Edit, you have the same power as everyone else. AND Yes, some pages have been blocked from edited, but they are few and far between. The main pages, the navigation, and the founders pages are about it. So start sharing information! Sniki is a resource for anyone and everyone who loves technology and staying connected. This site was built on the foundation of helping you and others find and share the networks (and social media campaigns) that interest you, your company, and your clients. At the top of the page you will find drop down menus for many different categories of social media and to the left you will find the Sniki Wiki menu to help you navigate the site, other users, and how to get started. If your having a lot of trouble finding what your looking for with the navigation, just type any keyword into the search box at the top right and it will bring up a list of pages that are tagged, named or have that word in the content of the page. If at any point you find a new site that you would like to share just visit the "how to create a page" or "how to edit pages" link and then share away! Don't forget you have to be a signed in "member" of this site to share and comment on all of the pages. Click hereto learn more about Sniki and Sniki Wiki's founders. Click hereto learn how to create a new page. Click here to view a glossary of helpful terms.